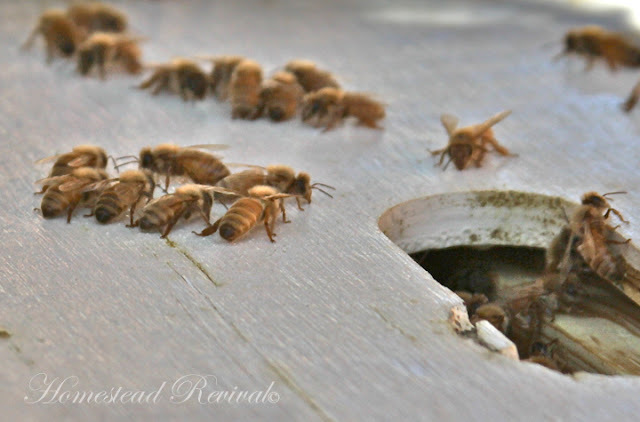 Homestead Revival: Busy As a Bee! Without a doubt, spring is my busiest time around here. I'm beginning to remember this so that I don't plan a lot and the girls get most of their homeschooling done before April. We're just finishing up on most subjects and it's a good thing! It's all hands on deck! 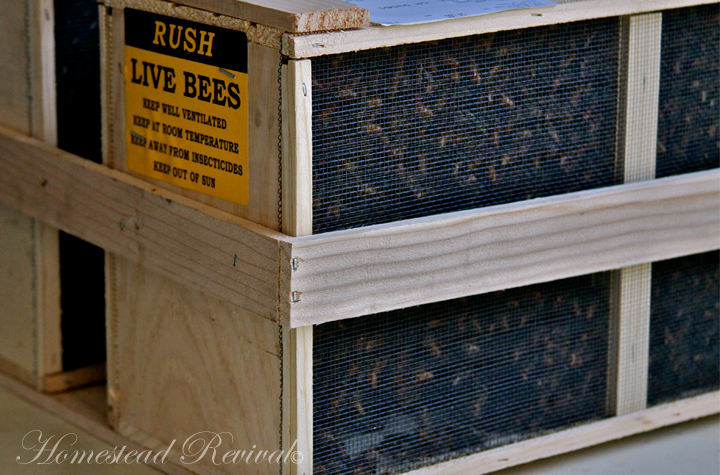 • Bees: Two packages just arrived and have been sitting overnight so they calm down before installation in their new home. Yesterday I cleaned hive boxes and got them mostly ready, but will finish this morning. The company accidentally sent Italian queens, but because of my climate, I really needed Carniolans. They're overnighting the royal ladies and so I'll have to give the workers extra time to adjust to their new monarchs. Please pray this year's bees are a success. This is an expensive venture due to shipping costs and if this group of bees doesn't work, I'm going to have to switch to ferral bees and I'm really not sure I'm up to that! 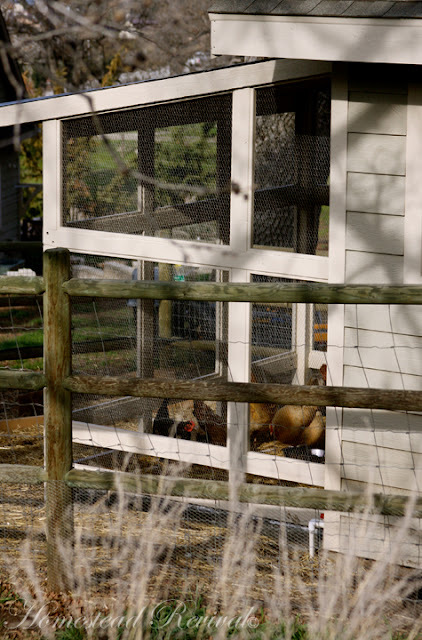 • Chickens: While the mature hens are down to 5 plus 2 roosters, I picked up 2 Plymouth Rocks and 2 Salmon Farvolles this past week. Twenty four more chicks arrive at the end of the month - 10 Blue Laced Red Wyndottes, 10 White Rocks (for meat), and 4 Rhode Island Reds. We're still trying to get the bobcat. It has become a daily thing... we've almost got it timed to when he shows up, but the girls are all locked up in their brand new chicken run (which is suppose to be for the chicks, not the hens!). 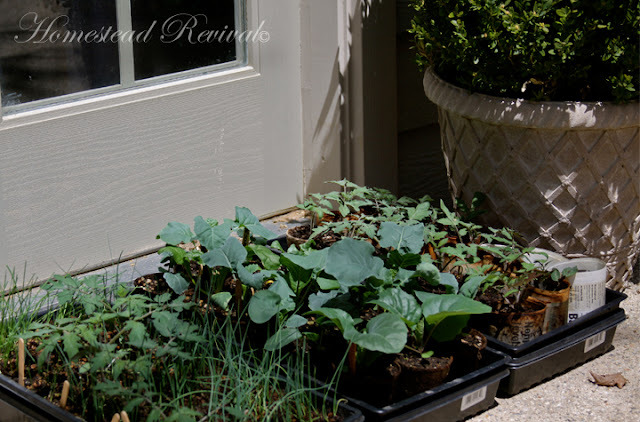 • Garden: Due to the mice (caught 3 so far), I'm having to replant peas, radishes, and lettuce. Some lettuce in another box is looking nice. I have broccoli, cabbage, cauliflower, a few beets, and onions started indoors along with about 24 volunteer tomatoes that came up in the onion tray! I used some compost from my worm bin and apparently I must have composted a tomato because these things sprang up everywhere. I pulled them out when they got larger, using a fork and being oh, so careful, and replanted them in their own pots. And they're looking fabulous! I have NO IDEA what variety these will be! Unfortunately, I'm not sure it was real good for the onions. Some are doing okay, but it's spotty. Today I need to start my warm weather crops indoors (my zone 7 plant out date is between May 15-June 1). I'm getting the season extenders down to a science, so I'm pleased with the progress there. Fencing is going in today as well for sectioning off the garden and goats, while creating a support for blackberries and such. Raspberries are also waiting to go in as well as some blueberries. We still need to make 2 more raised boxes, but the lumber company doesn't seem to have what we want and we keep waiting on them. Finally, my husband has some major plumbing issues to work on in the garden... we had a busted line this year because we didn't drain it in time and we learned a very expensive lesson! • Goats: Dance Hall is still milking nicely for a Nigerian. She is giving me 3 cups or more each morning and 2 - 2 1/2 each evening, although I've noticed whenever we get a cold snap or snow, her production goes down until it's warm again. She definitely does not like the cooler weather! Fiona has been bred twice and it has been unsuccessful both times. I'm going to try one more time, but before I do, I need to research what I can do to change her diet in order to increase her chances. In the meantime, we've about decided to purchase another Nigerian. (Oh, my! This is goat thing is addicting!) We had hoped to stick with Kinders, but after lots of research and talking around, all the breeders are 4-8+ hours away from us and that just isn't working out for us. 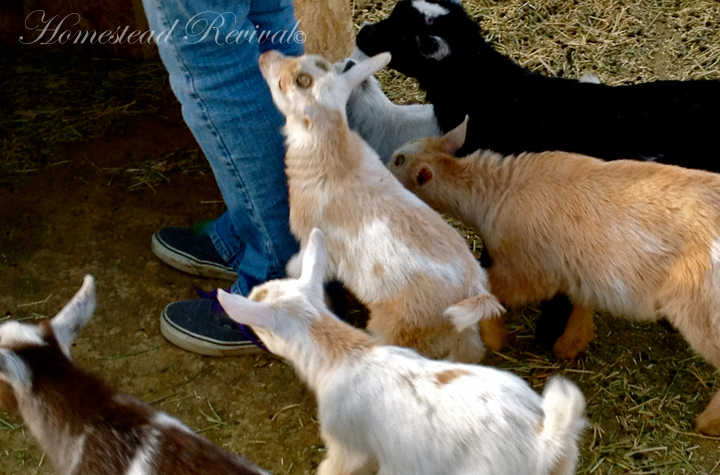 I've spent hours researching goat business... everything from minerals to feed! It's definitely a bit more complicated than chickens. And bees are more complicated than goats. But it's all extremely interesting and very satisfying. The number of nights we've set down at the table and recounted where all our food came from (and thank the LORD), and to realize that most of it was from our own homestead and that it tasted fabulous... priceless! Life is busy, but it's GOOD!